Showing 6 articles from November 16, 2014. The Titans come off the field after their final game of the season. 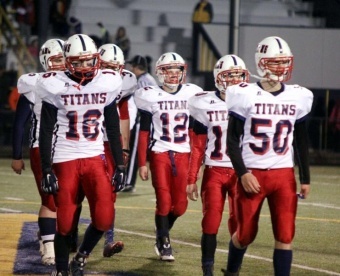 In their first year as a combined team the PWV Titans have shown the league that they will be a force to be reckoned with. ABERDEEN - On a bitter cold night under Friday night-lights, the Pe Ell-Willapa Valley (P-WV) Titans ended their season during the first round State 2B football tournament in a game with North Beach losing 27-12. Lebam, November 19- Lebam seems to be marked out as a special victim on which the flames reek vengeance. Since the destruction of the sawmill and business section of the town last May, four fires have occurred, home of W.T. Reaugh being the fourth. Wednesday evening around 7pm as Mr. and Mrs. Reaugh were preparing to leave home to spend the evening with Mrs. Reaugh's parents, Mr. and Mrs. Phillip Patton, a strange sound was heard upstairs. Mr. Reaugh took a lamp and went to see what was the cause of the disturbance. As he opened the volume at the head of the stairs, smoke plumed out.